Penelope is in a quarter-life crisis. Having dropped out of art school, she spends her days underemployed, drinking gin, and taking anonymous lovers. COSTER, Naima. Halsey Street. 332p. Little A. Jan. 2018. Tr $24.95. ISBN 9781503941175. Penelope is in a quarter-life crisis. Having dropped out of art school, she spends her days underemployed, drinking gin, and taking anonymous lovers. She can no longer hide out in Pittsburgh when she receives a call that her father, the incomparable Ralph Grand, has harmed himself, and she must come back to her home in Bedford-Stuyvesant in Brooklyn and care for him. Matters are further complicated when Penelope must reach out to her estranged mother, Mirella, now living in the Dominican Republic, who abandoned her father a few years before to rediscover herself back in the country of her birth. With great subtlety and detail, Coster has woven a tale that deals with gentrification, loneliness, and a very flawed and complex family. Penelope is deeply imperfect but remains relatable and real. 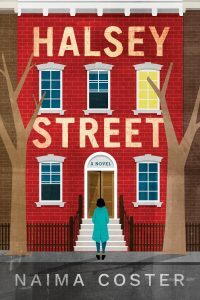 As she navigates a neighborhood that was once her childhood home, as well as the location of her father’s once successful business, she and her family grieve not only for what they’ve lost but also what they have become. VERDICT This is a tender story that packs as much hurt as it does heart. Recommended for fans of Zinzi Clemmons’s What We Lose and Brit Bennett’s The Mothers.–Christina Vortia, Hype Lit, Land O’Lakes, FL This review was published in the School Library Journal May 2018 issue.